The first year of a foal’s life is extremely important as it can determine his/her development. Nutrition during the first year impacts future health. The first three feeding phases are nursing, creep feeding (feeding concentrate apart from mare’s milk) and weaning. 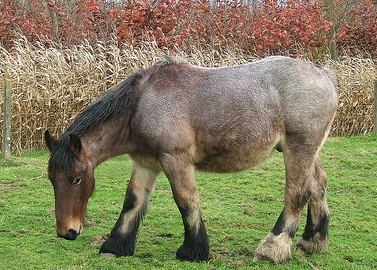 Skeletal growth, tissues, organs, all are affected by the foal’s diet. Foals begin nursing within the first 2 hours after birth. This gives the foal needed colostrum from the mare’s milk which provides antibodies for immunity to disease. Good nutrition is highly important for the mare as well so that she can provide needed nutrients to her foal. Foals will nurse frequently throughout the day, so the mare must produce an adequate amount of milk. Mares need to maintain their energy and weight and should be fed high quality hay and concentrate. The foal should be carefully watched to make sure s/he is nursing sufficiently. If not, contact your veterinarian immediately. When the foal reaches the 2 month old mark, creep feeding can begin. At this point the mare produces less milk and foal will not be getting adequate nutrition from the milk. Creep feeding should be provided for the foal, not the mare. This is a first step in weaning. The foal will also start to eat some hay or pasture. Choose concentrate made specifically for a growing horse. When the foal is completely weaned, s/he should be provided with good quality grass or mixed grass and legume hay. Clean water should be easily accessible at all times. Concentrate can be measured by 1-1.5% of body weight. Keep a record of your foal’s growth including height and weight and measurements of girth, body length and circumference of forelimb. This will tell the vet if growth is within normal parameters. Researchers have found that younger foals grow about 0.25 cm. daily while weaned foals grow at a slower pace, 0.05cm per day. If you need help devising the proper diet, consult with your vet and/or an equine nutritionist for the best results for the health of your foal.